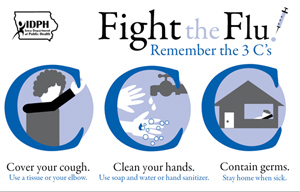 Flu postcard that will be sent to Iowans.Every Iowa household will be receiving a postcard in the mail later this month from the Iowa Department of Public Health. I-D-P-H spokesperson Polly Carver-Kimm says the postcard contains information about influenza and the H-1-N-1 flu virus. “On the back of the postcard, there’s also a message from (state epidemiologist) Dr. Quinlisk advising folks to get the seasonal flu vaccine and also talk to their health care provider about the H1N1 vaccine when that becomes available,” Carver-Kimm said. State health officials are printing and mailing over 1.5 million postcards. The mailing carries a price tag of nearly $200,000, which is being paid for by an H-1-N-1 grant from the federal government. Iowa may be the only state in the nation conducting a postcard campaign. “I don’t know if any other states are doing a postcard mailing,” Carver-Kimm said.